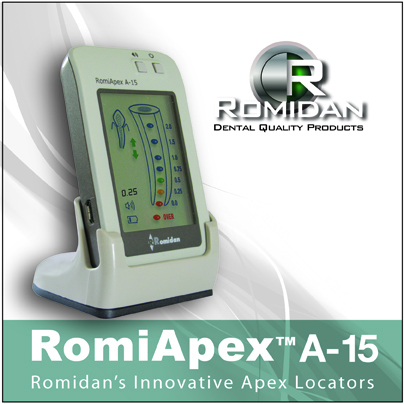 Romidan Ltd introduces the RomiApex A-15 Apex Locator. The RomiApex offers the endodontic specialists as well as the general practitioners a precise, user-friendly, easy to use apex locator. RomiApex's patented technology allows the unit to measure in .25 mm increments to the apex. A custom color graphic display supported by Selective Numerical Display, helps to achieve optimal endodontic performance required during root canal treatments while dual frequency AC signals are used to perform measurements automatically with no calibrations required. Audible signals sound as the apex is approached, and a warning tone combined with a numerical and visual reading indicates if the apex is passed.